Most police burglary statistics today estimate that in some areas over 50% of home burglaries are caused by a technique known as "lock bumping". The average home out there has three locks, the majority of which are Yale "rim style" locks, which are the most vulnerable to bump keys. The tool used in lock bumping is a so-called "bump key" - a special key that is created by filing down a regular key which would normally be used for that type of lock. If you hear a locksmith referring to a "999" key, they are talking about a bump key, as the maximum setting a locksmith uses to file a key down to would be a number "9" setting which files the key right down to the rim. Understanding how lock bumping works one has to have some knowledge of how the vulnerability of certain lock functions leave you wide open to a home burglary. The most widely used locks are cylinder locks, which offer good security against old school lock picking techniques, but fail against bump keys. Inside a cylinder lock, there is a barrel mechanism that turn inside a cylinder. When the barrel is turned clockwise 180 degrees, it releases the bolt, allowing the door to open. 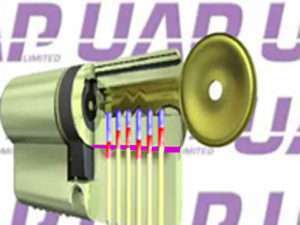 The function of a normal key is that the pins which restrict the barrel from turning are regulated to the correct height by the corresponding grooves (the so-called "shear line" of a lock) on the key. The pins are prevented from moving past the shear line by pins known as driver pins, which prevent the barrel from being rotated past a certain point - the very mechanism that makes the lock "lock"! Having the right key for the lock, regulates the driver pins because of its multiple ridges, as they push the driver pins to the right height for the barrel to rotate and open the lock. Notice in the image how the locks barrel turns and traps the pins at the shear line in a proper alignment. From here all the key does is lever that rotates the barrel. Learning lock picking is something that requires a fair learning curve, practice, fine motor skills and quite a bit of dexterity. This is not the case with bump keys! What Makes a Lock Vulnerable to Lock Bumping? The same innate mechanism of what makes the lock secure is exactly the same thing that makes it vulnerable in the first place! See, the driver pins and key pins all keep contact with one another through a tension created by a spring. They are not designed to separate except for when the cylinder barrel is rotated. Normally one shouldn't be able to push the key pin without pushing against the driver pin, and also when you push the driver pin too far it blocks the shear line. Its really an application of Newtonian physics here; when you apply force to one end of a chain of bodies, the force is transferred through the chain down the line towards the last object in the chain, all the while accumulating momentum (force). As the force is transferred from one body to another, the force builds up, thus the last object in the chain will separate from the others with the greatest force and speed (momentum). The driver pin is what directs the force against the key pins. And with enough sudden force (ie. the "bump"), all the pins will all follow in line down past the shear line, leaving the driver pins still hovering above the shear line. The reason that all the cuts on a bump key are filed to the maximum depth (remember, the number "9" setting?) â€“ is because it is totally undesirable to push the driver pin down at all just in case it shifts past the shear line before the "Bump" has the chance to start the momentum. There you go! The lock to your home has now been compromised in an instant! 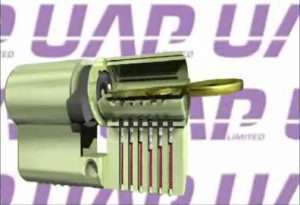 Your lock has now been compromised, and although just for an instant, it is long enough to allow the barrel to rotate past the shear line, and once that is done there is no further defense in place to prevent the barrel completing its turn and activating the bolt. The whole deal behind being able to bump a lock successfully is applying the force properly. After inserting the key in the lock, the key must be pulled back from the lock by one notch, giving you the space which allows you to create the momentum necessary by giving it a firm, but controlled strike into a full and deeply inserted position. One has to apply a rotational pressure on the pins to trap the key pins below the shear line, but not that much pressure that would hold the pins in place.The key hits the rim of the lock, comes to a sudden stop, which transfers the force through the notches down through the driver pins, and then to the key pins. Voila! If you find yourself the victim of a home burglary which was carried out by lock bumping, the most terrible thing is, as you have probably guessed, is that there are no apparent signs of break in. There are no signs of forced entry: kicked in doors, no broken windows, etc. This will create hassles with insurance companies for sure, as most of them will do anything to avoid a claim. The ways to protect yourself against lock bumping like getting high end locks, like mortise locks and/or installing home surveillance or home alarm monitoring systems.